Fibre Optix FX provides high quality LED lighting products and best quality Fibre Optic lights and bulbs for use in the home or commercial space. We can take on any project, no matter the size of the task. Contact us today to discuss your requirements. Below are just some of the application we can assist you with. Setting the right aura and mood in your bathroom is a key thing when creating your home. The lighting of the bathroom plays an important part in this. The correct LED bathroom lights can enhance the overall style and perception of the bathroom, and it can make the room appear more vibrant or larger in space and size. A kitchen is the central hub of many a home, it is the place where most family and social time is spent. The correct LED lighting for kitchens can help to enhance the room and mood. We have many kitchen lighting ideas for you to choose from. Why not ask one of our helpful staff on their lighting tips for your kitchen? There are hundreds of bathroom lighting ideas available to choose from, and ensuring you select the right one for your bedroom can be a tedious and baffling task. Luckily, our team are well equipped to help you - literally! We have tons of LED bedroom lighting products to choose from, and we can even assist you in choosing the right one for your room setup and size. If you own a garage, you will know one of the worst feelings in the world is not being able to find anything in it or actually get into it! A garage can be used for many things - car storage, general storeroom, relocation of old goods and so forth. With the right LED lights for your garage, we can make the stress of being able to see what you are looking to find a little less stressful. From the garden to the exterior building, parking space to a feature we have external and outdoor LED lights that are perfect for all weather conditions. You can browse some of the many products we have on our website or call the team to discuss your requirements and get our recommendations. 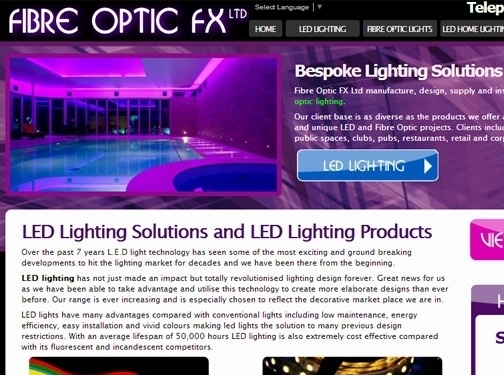 UK (Great Harwood, Lancashire) based business - established in 1995 - providing LED and fibre optic lighting solutions. Website includes product catalogue, work examples (case studies), accreditations gained, client list, blog, full contact details including company registration and VAT numbers.